(SitNews) Ketchikan, Alaska - Ucore Rare Metals, Inc. announced Tuesday their site selection program has identified Ketchikan as the premier location for construction of Ucore's first U.S. Strategic Metals Complex. The site analysis was conducted by Mike Schrider, P.E., V.P. Operations and Engineering of Ucore. According to Ucore, consideration was given to multiple domestic locations, including sites in South Eastern, South Central and the Western United States. In addition to the fundamental decision to initiate a rare earth element (REE) Strategic Metals Complex (SMC), selection criteria included logistical considerations such as the ease of access to international shipping corridors, industrial infrastructure, permitting considerations, and potential for local incentives and State funding programs. Bokan Virtual Tour: Click on the map or link to take the tour. The City and Borough of Ketchikan, with greater than 13,000 residents, is the southernmost population center in the State of Alaska, located on the protected and weather-temperate Inside Passage. The location is in proximity to a major container port and rail head at Prince Rupert, BC, 62 miles (100 km) to the Southeast, with the two locales connected by routing via the Alaska Marine Highway. Ketchikan features deep water port, barge-container facilities and direct access to markets in the United States and the Pacific Rim by way of ocean vessel, the lowest-cost mode of bulk transport. Ketchikan also offers a unique work force, ice-free harbors and is in close proximity to Ucore’s flagship in-situ development project, the Bokan Dotson-Ridge Rare Earth Project (“Bokan”) located on Prince of Wales Island. “Engineering and economic studies have confirmed that Ketchikan is our preferred location to construct our first strategic and critical metals separation facility” stated Schrider. “We’re pleased that Ketchikan has been selected from among competing locales,” said Randy Johnson, Managing Member of Orca Holdings and President of Tyler Rental Inc. Johnson, a Ucore Advisory Board Member, with over 35 years of business and industrial experience in Southeast Alaska, has been a strong advocate in Ucore’s decision to locate this SMC in Ketchikan. “The development will considerably broaden the economic base in Southeast Alaska,” continued Johnson, who was instrumental in developing the Ketchikan Shipyard, otherwise known as Alaska Ship and Drydock (ASD). Through a successful public-private partnership with the Alaska Industrial Development and Export Authority (AIDEA), Alaska Ship and Drydock grew the shipyard business to over $35M in annual revenues and worked closely with AIDEA to plan and orchestrate an $80 million plus investment in the shipyard. Alaska Ship and Drydock was subsequently acquired by Portland, Oregon based Vigor Industrial in February 2012 which has allowed Johnson the opportunity to support industrial development in Southeast Alaska, including his investment and involvement in Ucore. The Strategic Metals Complex will target the separation of rare earth containing concentrates to coincide with the increasing demand for electric vehicles and the need to provide a domestic supply of individual rare earth elements oxides for U.S. commercial and military technologies. Feedstock from locations in the continental United States, South America, Africa, Asia, and Australia are under consideration. The Ketchikan Strategic Metals Complex (SMC) will also potentially serve as the separation plant for rare earth elements (REEs) mined from the Bokan project into individual saleable rare earth oxides. 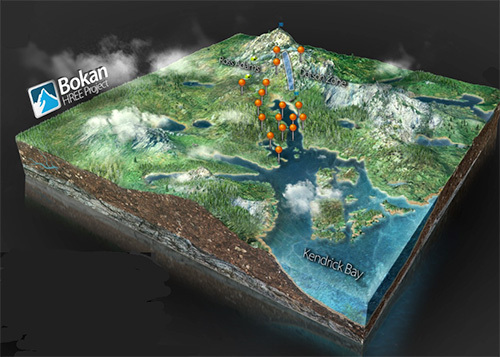 The Bokan-Dotson Ridge Project is located in Kendrick Bay on the southern end of Prince of Wales Island, approximately 37 miles southwest of Ketchikan. The project area includes approximately 9,500 acres of federal mining claims in the Tongass National Forest and 640 acres of state mining claims. The property is particularly enriched with heavy rare earth elements, including the critical elements Dysprosium, Terbium and Yttrium. Approximately 40% (by weight) of the rare earth elements contained on the Dotson Ridge property are heavy rare earths elements, as disclosed in the Company’s NI43-101 compliant resource estimate, released in March of 2011. Quoting a news release, Ucore envisions one or two additional Strategic Metals Complexs strategically located within the U.S. to provide domestic supply of rare earth elements (REE) oxides and other critical metals required to support North American manufacturing and security. The Bokan-Dotson Mountain is name for Robert "Red" Dotson of Ketchikan, Alaska. Dotson believed that riches lay beneath the surface of Alaska’s majestic terrain. Following his intuition to ground, in 1955 he and his wife Irene staked mining claims at Bokan Mountain. He passed away on September 3, 2012. In 2006, Ucore acquired and leased the Bokan property and found heavy rare earth elements (HREE) through large scale drilling. Since Ucore acquired rights to the Bokan property, it has continued its exploration program to further define and measure the resource. In 2012, Ucore completed a preliminary mine design and entered into a strategic contract with the U.S. Defense Logistics Agency. During 2013, Ucore led a Preliminary Economic Assessment to map out a prospective path to production and updated its resource estimate. In 2014, the Alaska State Legislature authorized Alaska Industrial Development and Export Authority (AIDEA) to issue bonds for up to $145,000,000 to finance certain infrastructure costs for the Bokan Rare Earth Elements project. Ucore provides local employment in cooperation with the Prince of Wales Tribal Enterprise Consortium and Ketchikan area businesses. Rare Earth Elements have become the backbone of innovation in the fields of clean energy, consumer electronics, computer applications, health care technologies and much more. Today, a great deal of what we refer to as the modern technology would be all but impossible without the Rare Earths Elements and their associated oxides and concentrates. According to the United States Geological Survey, China is the largest producer of rare earth elements and reportedly has the highest rare earths reserves at 44 million MT.